Before this serious stuff, the joke among Pinterest users was that it was the most beautiful, addictive time waster ever! And while I could see that, the best thing Pinterest has done for me is visually catalog all the things I want to TRY. And it surprises me how much I do end up trying! Among recipes, this vegan burger is a winner every time, these skinny monkey cookies are popular among all our household members, and these harvest pies we're the most effort I've ever put into one dish -- and I was glad about it every bite I took. I've also tried some cool crafts I've found on Pinterest. When three good friends announced babies-in-the-making this spring and summer, I knew it was time to let the quiltspiration come. 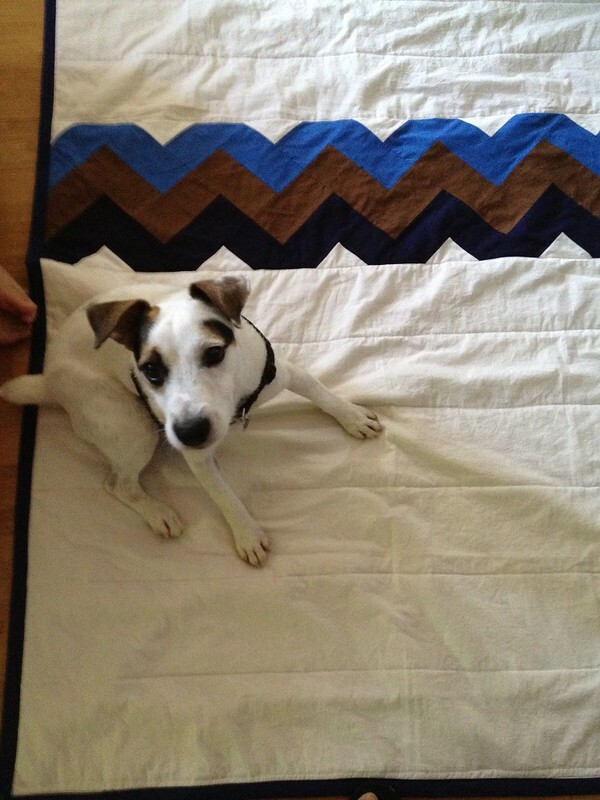 I started pinning quilts that caught my eye, and a few motifs kept surfacing, like the zigzag quilt. I am not the most precise sewist, so piecing triangles was not in my future. I remembered seeing (not on Pinterest, ironically) a great tutorial on zigzag quilts built from strips sewn together, then cut into squares. The zigzag dream felt achievable! 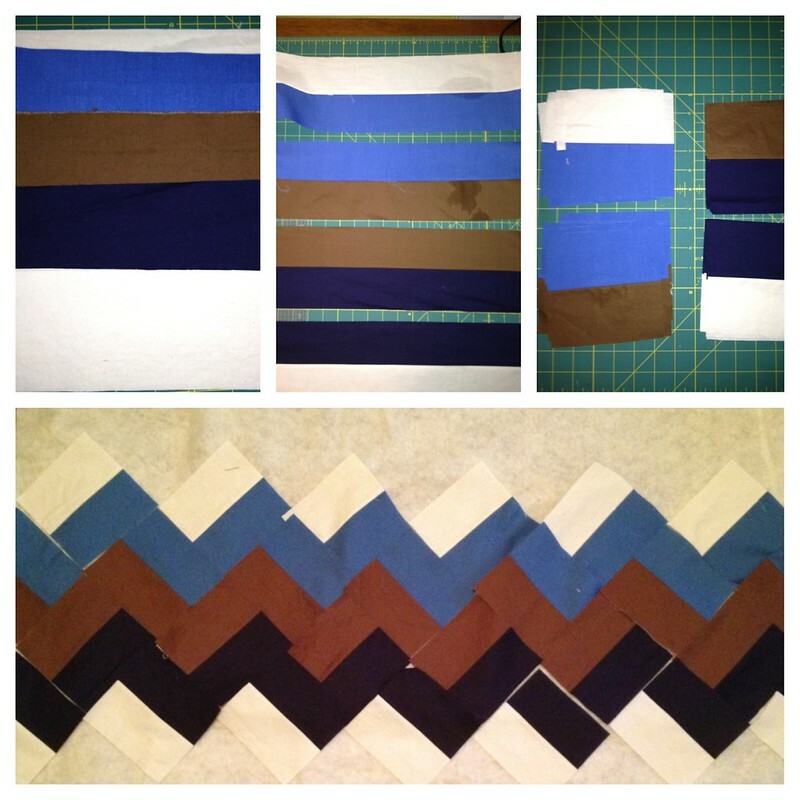 My friend Shannon was sure that her baby boy's room would be decorated in blues and browns, so I chose to do a few rows of blue and brown zigzags on a cream background for her baby's quilt. 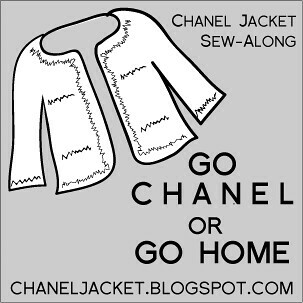 I'm really fast behind the machine, but am probably slower than average with measuring, cutting, pressing, etc. It took me an hour to press the prewashed fabric, cut the strips, sew them together, and cut the squares. It took about another hour to lay them out and assemble the quilt top. One more hour to figure out Plan B when I realized my fabric for the backing wasn't enough (used a cream-and-navy micro houndstooth print from the stash), quilt the top-batting-backing (only used horizontal stitches, about 5 inches apart), and sew on the binding. Four hours for a finished crib quilt - finished size approx. 42" x 56" - is totally reasonable for me, and I have to credit my machine for much of that ease. The two things my little machine doesn't usually handle well are heavy fabrics and quilts, but the stars were with me on this quilt, and I hope they will be with me on the future quilts, too. There was so little squishing between the feed dogs it was like I was using a walking foot when I wasn't! I love pinterest for the same reason. I am so visual, that this is the best way for me to remember what I want to remember. I think the quilt looks great, very clean and modern. Just jumped on the Pinterest bandwagon recently and love it as well. I like pictures so it works for me. Its like flipping through a magazine and building a collage or mood board. Loving the quilt. I haven't ventured into this territory yet. I have not tried Pinterest. Yet. I made my first quilt this year too. I pretty much winged it - and you can tell ha! I really like the combination of simplicity and bold colors. And thank you for saying "zigzag" instead of "chevron". Never picked you for a quilter. I like your design and your dog looks chuffed too. nice job! I'm going to try quilting this year, I swear.